September 2007 – Carla van der M.
I don’t know how long but for several years now in Oriental-Style. 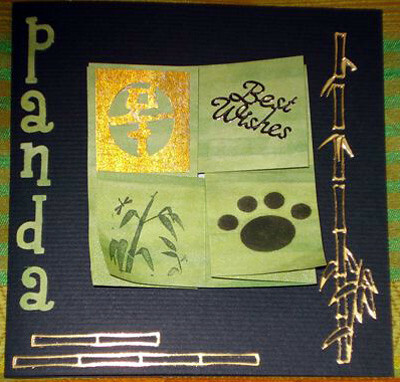 Before that I loved bear stamps – panda’s are favorite – (still do). I guess just the ordinary plain stamping with black ink and then color it in with aquarelle pencils and a drop of water. There are so many companies which have stamps that I like. I like our elite vendors – have some stamps of most of them. My fave is blue in all shades, but I like other colors too, but no neon’s. Just go with the oriental flow, do not think too long about the layout of a card or what stamp to use. Mostly the 1st choice is the nicest and best one. Well must be that little part of Indonesian in me that makes me like oriental things :o). Yes Japan for origami books and paper and the USA for the all the craft items we do not have here in the Netherlands. None, I must sadly say. In my surroundings there are no local clubs. OSA is the only stamping group I belong to. Once I was a member of a Dutch one. But several times a year I go to craft or rubberstamp conventions/meetings were you can do workshops at the vendors’ booth and buy stamps and other craft items. Oh golly, yes, but I have to think hard….Expressions, Craftstamper..mmm..must be one more but me old brain cannot think of it!!! Yes, Origami –since 1987- and teabagfolding, mostly used for making cards. I always like to try out something new (nowadays old things from about 25/30 years ago are ‘new’ again). And I like photography. Science Fiction, cruising on the internet etc. It’s relaxing for me, puts my mind to ease/rest after the work in our restaurant. Sometimes it can be the challenge to make a card or fold a medallion. What’s unusual, I think all the items we use are..lol.. or it must be a real twig, dried flower, leaf or wrapping paper or or etc. Our OSA-website . There is still lots to see that I have not seen yet. I do not have a favorite one. I like to google… put any name or subject in and lots of information, inspiration and examples pop up. And the biggest job is of course being a Mum and doing ‘jobs” in and around the house. I was born over half a century ago in a town called Hilversum, now-a-days known as Media-city where all the TV-stuff in the Netherlands comes from. Married for over 30 years to Hans, we have two sons Friso (26) and Erwin (23) and we live in Drachten, a town in the Northern part, called Friesland of the Netherlands also better known all over the world as HOLLAND with the wooden shoes, tulips and windmills. Our sons are working in our business too and are planning to take over in the near future, so we can take a step back and join the good things of life and live a bit better. So in the future more time I hope for stamping, crafting and so on!!! By Carla van der M.
A tato is a traditional kind of folded paper purse in which a Japanese lady keeps small items such as needles, ends of thread, buttons and so on. A tato can be flat and practical or fancy for gift-giving. The most common tato looks kind of geometrically-floral and used for giving small gifts. 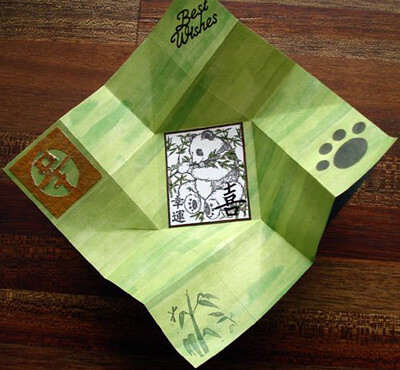 This origami model can be to use on a card or when made larger use as gift envelope. I don’t know whose model this is. I received it also once on a card. Fold into 4 squares with valley folds. After folding turn over the paper. Fold SHARP the side to the middle and back with valley folds. Do all sides this way. Now you have 16 squares in the paper. Turn over the paper. Bring 1 corner to the this point, do NOT fold it yet!!!! See next picture!!!! Just fold VERY SHARP only this small part of the paper. Fold all corners this way. These are the folding-lines after doing this. Sharpfold the mountain folds again. After sharping it, the model should look like this in 3d. Now take the left part and use your other fingers for the other side (right), and bring it to the middle. If you have folded it sharply it will almost fold into place by pushing it. The model completed. See the cards I made for what you can do with it. At the link you can see how to fold a traditional Tato. The site is in German but the photos show you very clearly how to do it. If you need a translation of something you do not understand let me know through the group. 3 Responses to September 2007: Carla v.d.M. Congratulations, Carla. You are definitely the origami queen. You create origami projects so easily and professionally. Love your project! Thank you for the tutorial for making an Origami Tato and the interesting background information.